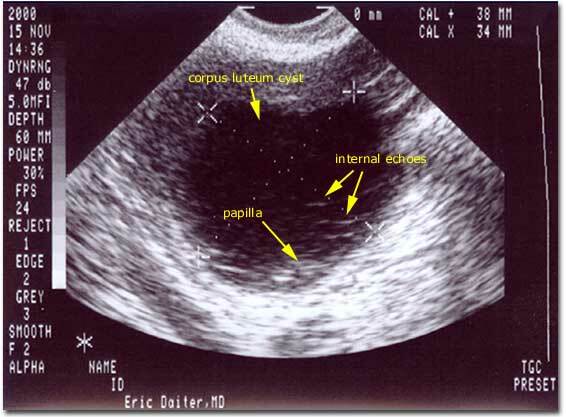 Photograph of a transvaginal ultrasound identifying an ovary on cycle day 24 (mid luteal phase). The corpus luteum cyst measures 35-36mm in diameter (usually ranges from 25-45mm in diameter). The corpus luteum cyst develops from the collapsed follicular cyst (ovulation occurs and the collapsed cyst that released the egg then reaccumulates with fluid to become the progesterone producing corpus luteum cyst). The corpus luteum cyst often has a more complex appearance than the follicular cyst, possibly with internal septations, an outer scalloped contour, or internal echoes with loculations or papillae. It is thought that these changes occur due to the local bleeding, clot formation and clot resorption that may occur during and shortly after ovulation.